Our 7 day weather forecast for Waterrow updated throughout the day, making it ideal for planning leisure activities, travel and events. Read more about our weather forecasts. On Monday 22nd April 2019 the sun will rise at 06:05 and will set at 20:20. It will be a mild day, with temperatures reaching around 16.4°C. Today is expected to be a dry day, with a very low chance of rain. It will be quite a breezy day, with a maximum expected wind speed of 20mph. Our weather forecast for Waterrow is updated throughout the day and has been found to be very reliable for planning activities such as days out, leisure, travel, events, fishing, golf and gardening. 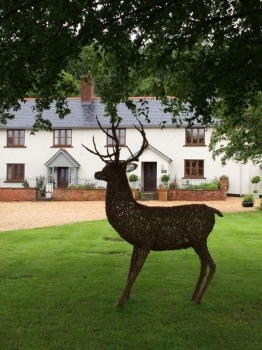 Handley Farm offers top quality self-catering cottages and bed and breakfast accommodation. Set in a stunningly beautiful rural location you are ideally placed to enjoy the natural delights of Exmoor, the rugged North Devon coastline and the countryside of Devon and Somerset. We offer two private barn B&B Suites. The Cider Barn sleeps Six is self catering and has a hot tub on the out side decking and has a private garden with stunning views. The old stables is self catering and a real touch of luxury for two people with a free standing bath in the bedroom and a beautiful open plan kitchen / lounge with vaulted ceiling. Set in a pretty south-facing courtyard, all our accommodation is equipped and furnished to an exeptionally high standard, which is matched by our hospitality and commitment to customer service. Enjoy a truly memorable holiday – treat yourself to a stay at Handley Farm and you may become one of our many visitors who come back again and again.